I can tell you from personal experience that an Alaska cruise is not complete without a land tour. The coastal cities are great for adventure and nature-based excursions, but you can’t say you’ve seen the heart of the state until you’ve ventured into the interior. If you’re looking to save on an Alaska cruise tour, one option is to take advantage of Princess’ Wave Season sale. 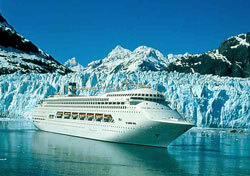 Through March 31, Princess’ “Alaska Wilderness Sale” offers couples $500 off already discounted early-booking fares. Customers can create a personal experience by combining a Gulf of Alaska cruise with one of 22 land-tour options. An 11-night cruise tour starts at $1,399 per person. Princess is dedicated to the Alaska market. In 2007, eight Princess ships will offer Alaska cruises, and guests can ride special Princess train cars and buses and stay in Princess lodges on land. I’d say that Princess and Holland America are the leaders in Alaska cruises, given their presence in the state, so you should expect a streamlined and well-planned vacation when you choose these providers. To book a Princess cruise tour, call 800-774-6237, visit Princess’ website, or contact a travel agent.